At the 2014 North American International Auto Show in Detroit, GM unveiled the 2015 GMC Canyon, a midsize pickup truck. It is an all-new model that along with the Chevrolet Colorado puts GM back in the midsize truck game. The Canyon was last produced in 2012; the new model continues the traditional body-on-frame layout of the original vehicle and will be sold in 2WD and 4WD configurations. With the Canyons return, GMC will offer a three-truck line up with midsize, full size and heavy duty models for the brand. GMC claims that the new Canyon will deliver class-leading capabilities with the brand’s signature refinement. 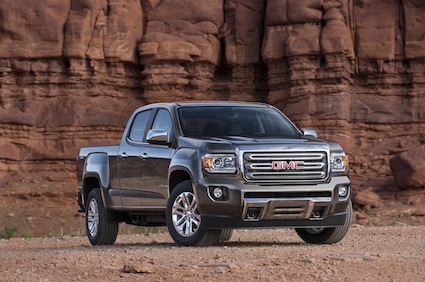 The 2015 GMC Canyon will be powered by a 2.5-liter four cylinder engine making 193 horsepower at 6,400 rpm and 184 foot-pounds of torque at 4,400 rpm. Both six-speed manual and six-speed automatic transmissions will be available. Optionally, GMC Canyon shoppers can choose a 3.6-liter V-6 engine making 302 horsepower at 6,950 rpm and 270 foot-pounds of torque at 4,000 rpm. A six-speed automatic transmission is standard. Come 2016, a Duramax 2.8-liter turbodiesel engine will be added to the powerplant mix. The Canyons similarity to the larger Sierra is evident across its body lines. The trucks front-end styling brings in the lone standard projector beam headlamps in its segment along with the brands signature C-shaped LED daytime running lamps on all models. GMC will offer three body configurations: An extended cab model with a six-foot bed, a crew cab with a five-foot bed and a crew cab with a six-foot bed. With the tailgate down, six-foot long bed models make it possible to haul eight-foot-long items. The 2015 GMC Canyon will be sold in base, SLE and LT models in both 2WD and 4WD configurations. An all-terrain package will also be offered with the SLE line. That package includes 17-inch painted aluminum wheels clad within all-terrain tires, a body-color grille surrounded by horizontal chrome bars and specialized suspension tuning. 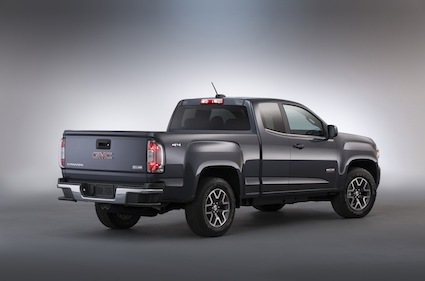 Other features that mark the GMC Canyon include active aero grille shutters, a CornerStep rear bumper design, and an available lift and lock rear tailgate, features that the competing Toyota Tacoma and Nissan Frontier do not offer. Multiple rear tie-downs, standard bed rail and tailgate protectors, an available spray-in bed liner, and aluminum wheels ranging in size from 16- to 18-inches will be available. Inside, the Canyon will feature an upright instrument panel, a sculpted headliner, sculpted door panels, an upper-instrument panel storage bin, a center console large enough to hold a table and rear under-seat storage. A power-adjusted drivers seat is standard; heated leather seats are included with the SLT edition. Available features include an eight-inch diagonal color touch screen with multiple USB ports, fourth generation OnStar with a built-in Wi-Fi hot spot, Chevrolet IntelliLink infotainment, GMC AppShop and navigation. The GMC Canyon will sit on a 128.3-inch wheelbase and measure 212.4 inches long, 74.3 inches wide and 78.7 inches tall. The extended wheelbase crew cab gets a 140.5-inch wheelbase and measure 224.6 inches long. The Canyons weight ranges from 3,944 to 4,266 pounds. Its payload is 1,400 to 1,450 pounds. When property equipped this truck can pull up to 6,700 pounds. The new truck will feature a coil-over-type front suspension with aluminum knuckles that are low in mass and high in strength for what GMC says contributes [sic] to a more responsive, immediate feel to driver inputs, as well as efficiency. 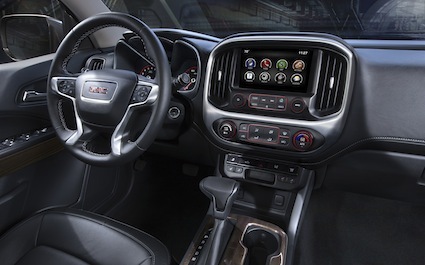 Electric power steering, four-wheel disc brakes an available automatic locking rear differential, and available automatic four-wheel drive with an electronically controlled transfer case are other features of the GMC Canyon. Pricing, additional trim details, and other product information will be offered closer to its release date. The new truck will be built in Wentzville, Missouri, with production expect to commence by this fall. 2015 GMC Canyon photos courtesy of General Motors Company.